How Serious Are Orthodox Bishops About The Eucharist? Share the post "How Serious Are Orthodox Bishops About The Eucharist?" It has come to my attention that there are an increasing number of parishioners in some of our parishes who come forth to receive Holy Communion, but insist that the priest not give to them of the Body of Christ but only of His Blood. Those parishioners explain to their priests that their doctors — obviously not Orthodox Christians — tell them not to eat any kind of bread because it will harm them. 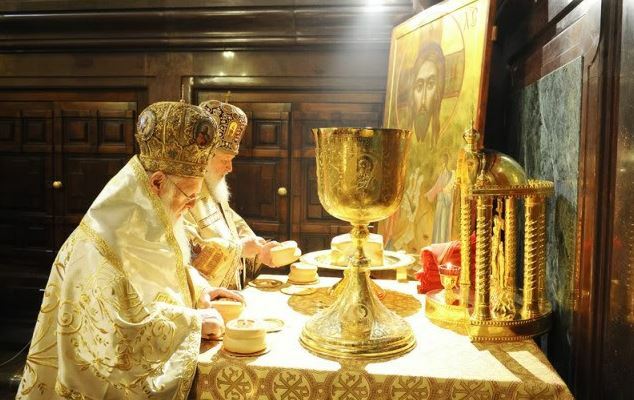 If there are Orthodox Christians in our parishes who believe that, after the Holy Spirit consecrates the Bread and the Wine during the Divine Liturgy, the gifts are still bread and wine, they should never again receive the divine Body and Blood again, until they believe that the holy sacrament of our Lord Himself is His spiritual presence, that is, both His Body and His Blood. In regard to these powerful words of Saint Paul, are there parishioners who are ill, possibly because they have not prepared themselves to receive the divine gifts of our Lord’s spiritual Body and Blood? And, if the doctor’s instructions to them about not eating the Body (bread) because of the doctor’s medical knowledge are considered more important than the Holy Eucharist, then they should not receive the Holy Eucharist of the Lord, unless or until they believe that the Creator of all has more knowledge regarding eternal life than all the medical science of this fallen world. This serious matter is proof enough that the secular world is developing into the false philosophy that it is self-created, in relationship to the theory that all creation is incidental and accidental. Consequently, the world, which is based in materialism, is more and more identifying itself, especially humanity, as it pleases, since it does not acknowledge a divine Creator. If any parishioner does not fully believe that the Lord Jesus Christ is our Creator, and that He came into the world, taking on our human body, but His Body being perfect, and offering Himself up on the Holy Cross for our eternal salvation, please help such persons to realize their error, if they wish to listen. Of course, it is up to them to exercise their free will to accept our Lord as we know Him, or to take the only other direction, that is, turn away. from Him. We pray that the Holy Spirit will give to them the only direction to eternal life, and that is to know and to love our Lord Jesus Christ as our Savior and Redeemer. This letter is to be disseminated to all parishioners and published in all parish bulletins of the Metropolis of Denver.